Posterior reversible encephalopathy syndrome (PRES) is a rare syndrome that presents with neurological manifestations, often associated with arterial hypertension. Magnetic resonance imaging (MRI) shows bilateral white matter oedema in the posterior vascular territories. Immunosuppression, (pre) eclampsia and autoimmune diseases can be implicated. A 27-year-old woman, with mixed connective tissue disease under azathioprine, was admitted in the emergency room in status epilepticus and with severe hypertension. The MRI showed bilateral oedema in a pattern compatible with PRES. There was clinical improvement after azathioprine suspension. PRES is typically reversible with prompt recognition of the syndrome and its trigger. The association with azathioprine is rare. Fischer M, Schmutzhard E. Posterior reversible encephalopathy syndrome. Med Klin Intensivmed Notfmed 2016;111:417–424. Bartynski WS. 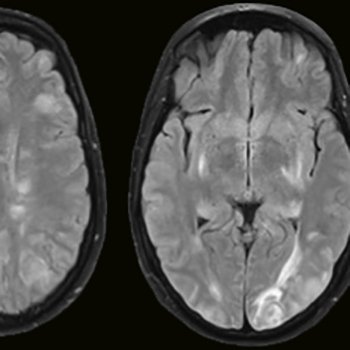 Posterior reversible encephalopathy syndrome, part 1: fundamental imaging and clinical features. AJNR Am J Neuroradiol 2008;29:1036–1042. Hobson EV, Craven I, Blank SC. Posterior reversible encephalopathy syndrome: a truly treatable neurologic illness. Perit Dial Int 2012;32:590–594. Lee VH, Wijdicks EF, Manno EM, Rabinstein AA. Clinical spectrum of reversible posterior leukoencephalopathy syndrome. Arch Neurol 2008;65:205–210. Facchini A, Magnoni S, Civelli V, Triulzi F, Nosotti M, Stocchetti N. Refractory intracranial hypertension in posterior reversible encephalopathy syndrome. Neurocrit Care 2013;19:376–380. Foocharoen C, Tiamkao S, Srinakarin J, Chamadol N, Sawanyawisuth K. Reversible posterior leukoencephalopathy caused by azathioprine in systemic lupus erythematosus. J Med Assoc Thai 2006;89:1029–1032.